The Untie is a bendable ribbon that stays positioned wherever imagination takes it. It's designed not just to manage cords, but to wrap them up like fabulous presents. Use the 10" Untie is for everything from lamp cords to computer cables and the 5" for earbuds and shorter cables. Dimensions: 5 inch: 5" x 1.4" x 0.13"; 10 inch: 10" x 1.4" x 0.13"
Weight: 5 inch: 0.04 lb. ; 10 inch: 0.08 lb. 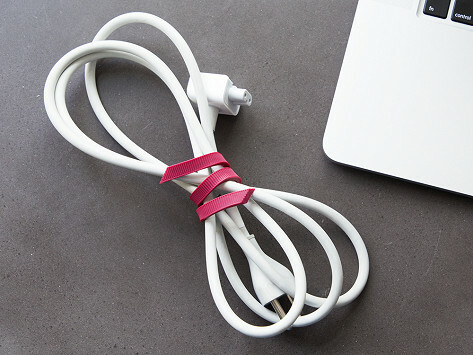 These are great...and for more than just keeping wires organized. I have ordered more. These longer cords are more than enough length to keep what I want securely in place. Keep the cords in your life under control with these colorful, rubber, twistable ties. Strong and bendable, you can use and re-use them without needing to clip or fasten anything. The design even doubles as a device stand. Long-time friends Cindy Glass and Dante Pauwels are the brains behind Unplugged Goods. Their very first idea came from a napkin sketch while the two were out to dinner. Since that initial paper drawing board, they’ve helped hundreds of earbuds, charging cords, and plugs stay neat and tidy.